Just as you’re finally mastering the art of squeezing your business’s message into a 140-character tweet, Twitter (NYSE:TWTR) goes ahead and changes it, sending the Twittersphere into disarray! After much speculation and hesitation, Twitter is currently testing an increase to its renowned 140-character limit. Some users are able to compose 280 character tweets. That’s like two tweets in one. Incorporating Twitter into a marketing agenda has long been an important strategy for small businesses. Posting succinct tweets is a powerful way for businesses to gain engagement, brand recognition and organic growth. Small businesses on tight budgets take advantage of this powerful marketing tool to broaden their reach and increase brand appeal. If this change takes hold for all users, businesses will have a bit more room to expand their messages on Twitter. It’s also likely to cause small businesses to rethink the messages they currently send out. 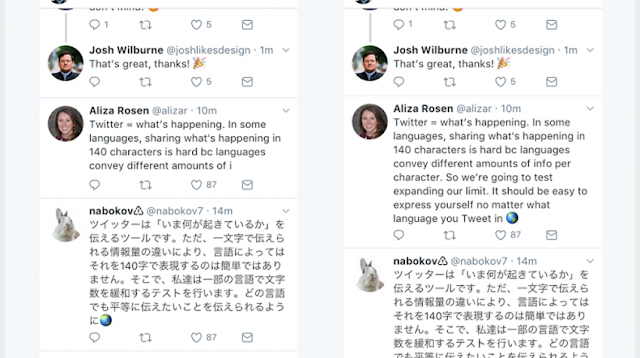 Aliza Rosen, Product Manager at Twitter, noted the reasons behind Twitter’s character extension roll out. “We want every person around the world to easily express themselves on Twitter, so we’re doing something new: we’re going to try out a longer limit, 280 characters, in languages impacted by cramming (which is all except Japanese, Chinese, and Korean)”, Rosen said on the Twitter blog. Naturally, #280characters has been trending high on Twitter and there have been mixed reactions to the 280-character rollout. Reading a thread of 20 tweets with #280characters will now look like this. Recognizing the restrictions of the brevity of its posts, Twitter has, for years, been gradually reducing its restrictions. Last year, for example, Twitter stopped including images and retweets as part of the limit. Embrace or oppose the character extension, by increasing the number of characters available to use, businesses will certainly get more ‘room for maneuver’ when expressing their messages on this social media site.